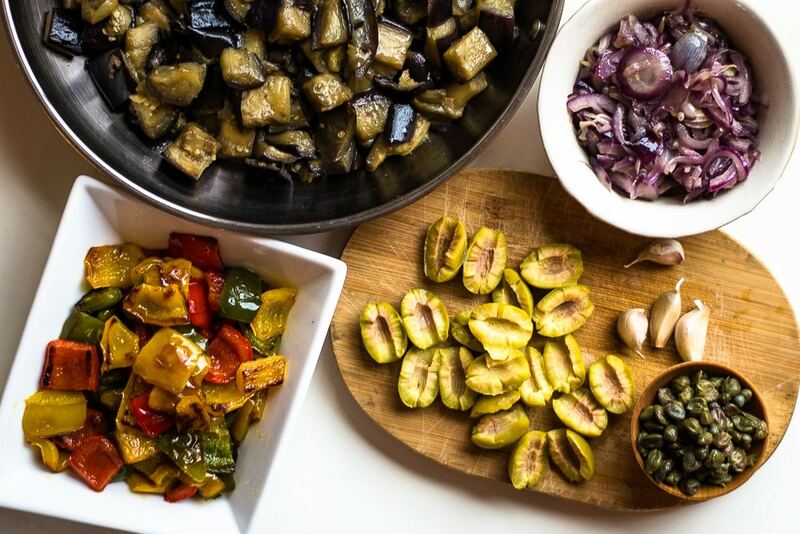 Granny’s and Mummy’s peperonata with aubergines and capers is one of my favourite dishes! My mum came from Friuli Venezia Giulia, a region in the far north east of Italy, bording with Slovenia. My dad comes from Sicily, the very deep South of Italy. They met in Milan where she was working and he was performing his military service. My mum hadn’t seen much of the world. Together they moved to work in German Switzerland first, and to South America (where my dad got a job) later on. They got married in Colombia, where my siblings were born. When they came back to Italy they stayed a while at my granny’s and grandad’s in Sicily. At that time (and also now, at some degree, but much less) North and South of Italy were two different worlds. My mum, who loved cooking as I do, got to know Sicilian recipes, which were unknown and almost exotic to her! A good number of those recipes included, as a basis, this peperonata with aubergines and capers. I have always loved it. And here I am keeping my promise! The reason behind my sister’s doubts was that this peperonata requires a bit of preparation as peppers and aubergine cook in different times. Using two pans at the same time helps. The recipe is surely my granny’s. But to me is also my mummy’s because I learned it from her and she was cooking it at least once a week, besides I unfortunately have no memories of my granny as I last saw her when I was two. Peperoni is the Italian term for peppers, and peperonata means “made of peppers”. We always called this dish peperonata even if there are a lot of aubergines in it. But in case you don’t know, as in many Italian recipes, for every dish there are hundreds of variations, and some of them have different names. 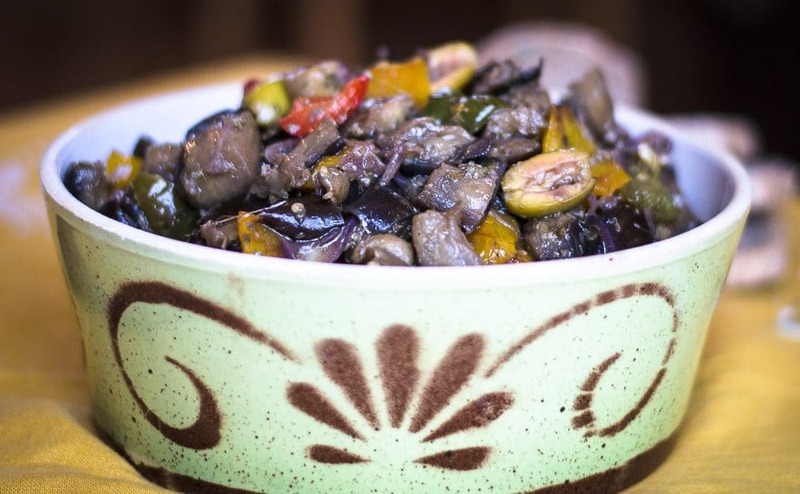 One of the most common variation is caponata, another Sicilian dish which is a very similar to peperonata. I’m going to write caponata‘s recipe in the future! This Sicilian peperonata with aubergines and capers is not a light dish, as it is rather oily but it is soo tasty. It can be eaten as a side or used as a pasta or rice dressing or as a filling for a sandwich. Cut the peppers in rectangles. Heat some olive oil in a frying pan. Stir fry the peppers and when they are cooked move them in a dish. (do this if you want to use only one pan). While the peppers are frying cut the aubergines in dice. In the same pan you fried the peppers fry the aubergine, only they would need further oil. Aubergines are like sponges!! When they are nice and soft remove them from the pan. Wash carefully the capers throughout a sieve. Cut the olives in half. Place the sliced onion in the same pan and sweat it. Add peppers and aubergines and stir. Add capers, olives and the garlic cloves crushed and salt. If you have basil it goes very well on top of the peperonata with aubergines and capers! Thank you Grainne, I really enjoyed cooking and eating with you!